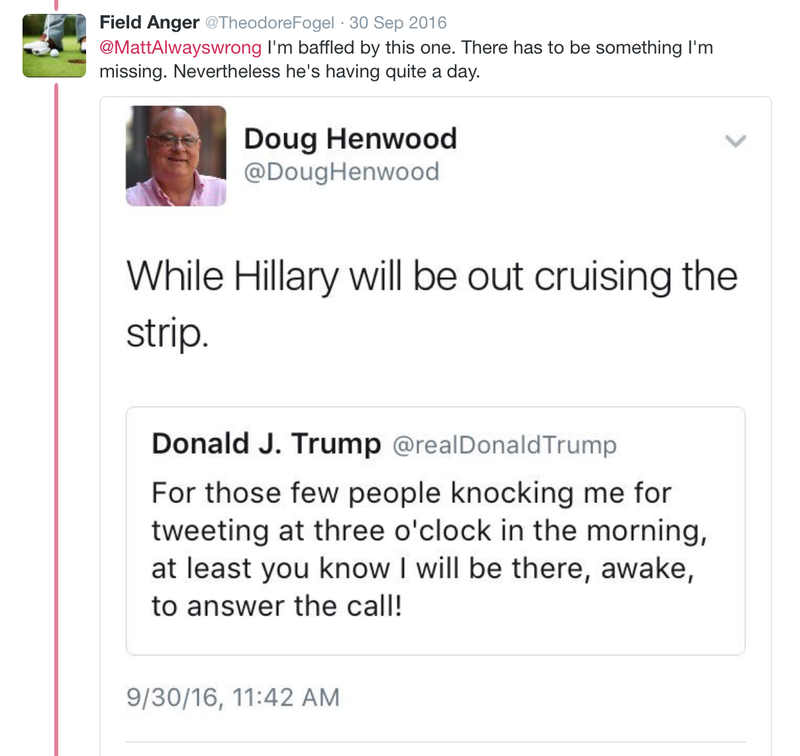 It's well known that Doug Henwood, leading feminist-hating brocialist (with his own ladies auxiliary) and some time writer for The Nation (and friend, or I hope for her sake, former friend of Katha Pollitt) hates Hillary Rodham Clinton more than anybody on this earth. So it's really no surprise that when it comes to anybody versus HRC, Henwood will pick anybody, every time. And that includes Donald Trump and Vladimir Putin. 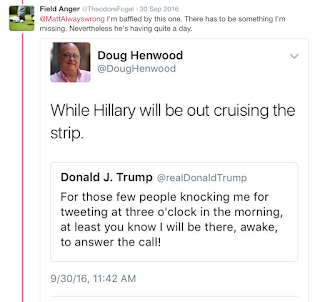 I already mentioned Henwood siding with Trump a few weeks ago. And here he is back in September. But it isn't just his hatred of Clinton. 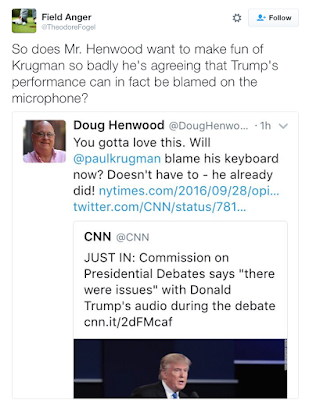 Henwood appears to look for opportunities to hate all enemies of Trump. Like this. And he certainly doesn't want you to think that Trump had any help from Putin. 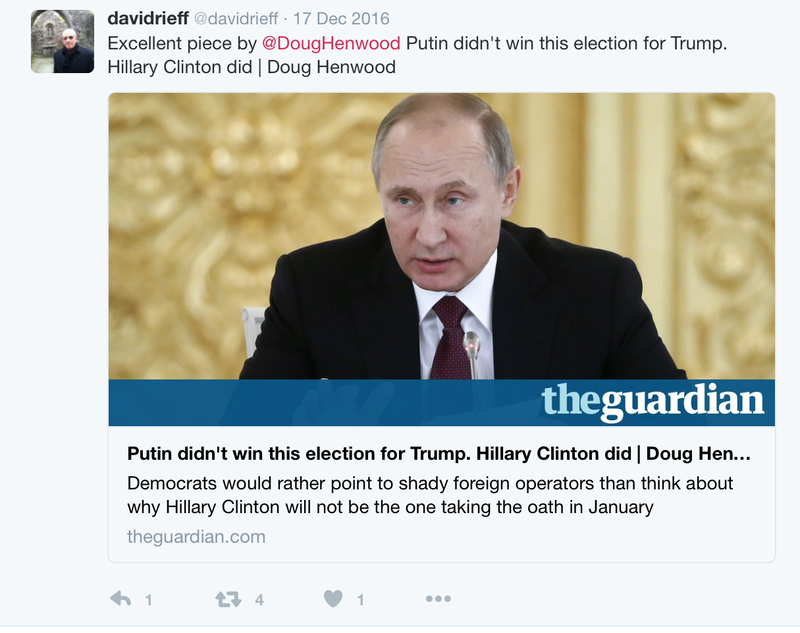 The Far Left apparently loves Putin just as much as the Far Right. I had wondered how Henwood could live in an expensive place in Brooklyn when he and his wife Liza Featherstone seem to support themselves through careers that consist entirely of blogging, adjunct teaching and writing for Verso books, The Nation and Jacobin. Somebody emailed me recently to give me a heads-up on this - Henwood writes something called the Liscio Report on the Economy, which charges a yearly subscription of $7500. So now we know who counts as the real elites in Henwood/Featherstone world - not subscribers to the Liscio Report, not the Koch brothers, whom Henwood has defended, not Trump or Putin. No, the only elites in their world are feminists, Paul Krugman and Hillary Clinton.